Using a sharp knife, remove the top half-inch of the eggshell, as neatly as possible. Pour eggs into bowl, add cream and whisk. Set aside. Wash eggshells inside and out, very gently, then put into a small pan of water and bring to a boil. Turn off heat and allow shells to remain in the hot water. 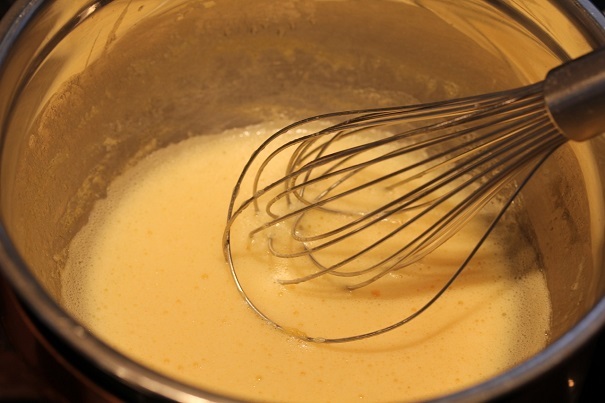 In a medium saucepan, melt butter at very low temperature, then add egg and cream mixture, whisking and heating very slowly so that the eggs thicken. This should take about ten minutes. Add salt and pepper. Keep eggs warm. While eggs are cooking, drain eggshells on paper towels. Toast bread and cut into strips, sometimes known as “soldiers”. Put shells in eggcups, spoon eggs into shells and top with caviar. Serve with toast strips on the side.